I usually preach in a second language that has no English diglot in my Tagalog translation of choice. So I imported Tagalog as a user Bible and use iOS Accordance as my diglot. Super nice. But it does mean printing my notes instead of using them on the iPad. 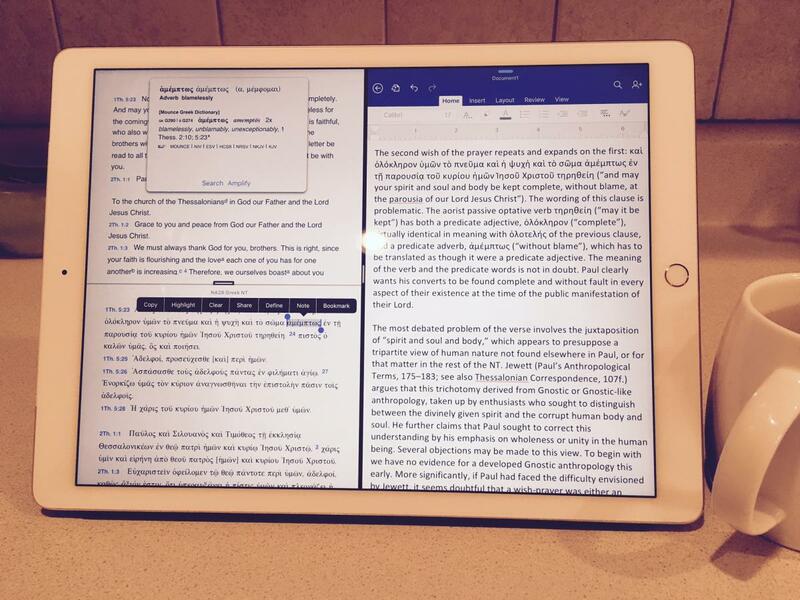 Hence... really looking forward to Accordance being iOS 9 split screen capable! Just a little shout out there. I read somewhere from an internal accordance person that the next iOS update has it. Sounds like it's already running too so maybe soon. YEs, the current beta we are debugging has it, and it seems to be working well. I am not privy to release dates nor to whether this feature will actually make it into the release version, though it seems pretty solid. There are still a number of apps out there that don’t support it, so YMMV in actual practice. Just a loud thank you coming from here. I totally love having this ability. It's transformative for my workflow. Thanks so much!